Stems: Erect to ascending, several to many, bushy-branching from base, woody. Leaves: Alternate, simple, sessile, linear to nearly filiform, .5 to 2.5 inches long, less than 1/8 inch wide, midrib prominent; margins entire, sometimes rolling inward. Inflorescences: Numerous clusters of 2-5 heads, terminal; bracts narrow, green at tips and along mid-nerves. Flowers: Ray florets 3-8, less than 1/8 inch long, yellow; disk florets 2-6, yellow. Fruits: Achenes, short, finely hairy, brown, tipped with 8-10 pointed, whitish scales, enclosing small seed. Habitat: Dry, open prairies, uplands, disturbed rocky or barren sites, most abundant in sandy and clay loam soils. Toxicity: Toxic to cattle and sheep. When consumed at particular times during pregnancy, it can cause abortions or weak calves and lambs. Forage Value: Broom snakeweed is unpalatable to livestock, and they will not consume it unless other forage is unavailable. Uses: Native Americans used broom snakeweed to treat colds, coughs, respiratory difficulties, snakebites, and insect stings. Comments: Forb or subshrub. Broom snakeweed often is observed in overgrazed pastures. 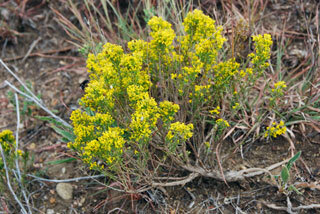 The name "turpentine weed" alludes to the pine-like odor of crushed plants.